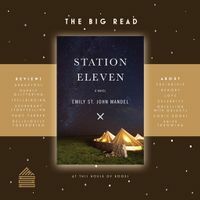 Pick up a free copy of Emily St. John Mandel's book, Station Eleven. Read it, then let's talk about this book that the critics variously have described as audacious, darkly glittering, spellbinding, exuberant storytelling, page turner, deliciously foreboding. Share your thoughts, your questions, and your ideas about what the book is about and what it means.